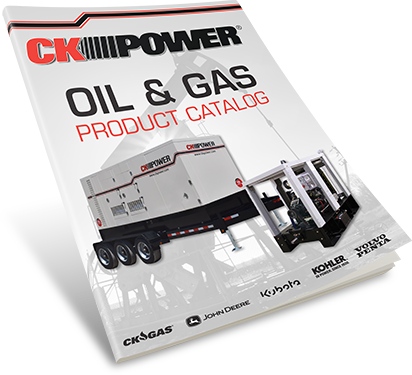 CK Power offers a complete line of prime power solutions for the oil and gas market. We engineer prime power generator sets for every type of exploration and extraction equipment including pump jacks, power jacks, rigs and other production equipment. We have extensive experience working with hydraulic fracturing equipment, as well as with conventional drilling equipment. If you’re looking for expert assistance in the engineering and design of Tier 3 and final Tier 4 engine applications in the oil and gas market, you’re looking for CK Power. We aim to be the oil and gas industry’s go-to source for understanding and implementing the EPA’s final Tier 4 emission standards. From which applications are affected to the best strategies for limiting your output of NOx and particulate matter, we’ve got the expertise to assist you with the transition. We don’t operate by pulling our best guess at a product solution off the shelf and handing it over to you for installation in your equipment. Our engineers will work with you to tailor natural gas and diesel gen sets that perfectly compliment your application. While some of our competitors may have outgrown our personalized approach to power solutions, CK Power is committed to remaining nimble enough to design the perfect prime power generator for your equipment. And when you buy power solutions from CK Power, you can rest assured that you’re not only getting a perfectly engineered power solution but also guaranteed access to a parts and service network that’s unparalleled in the power generation industry. Our parts and service department is knowledgeable, experienced and committed to keeping your equipment running as smoothly as the day you bought it. So if you’re in search of power solutions for oil and gas exploration and production equipment, need assistance in making the transition to final Tier 4 engine applications, or you just want to make sure you have access to knowledgeable professionals after the sale, contact CK Power today.